Back in September we told you about Kim Suozzi, the 23-year old neuroscience student who was in the midst of battling terminal brain cancer. Sadly, she passed away last week on January 17th — but not before a successful fundraising campaign managed to secure the funds required to grant Suozzi her dying wish: cryonic preservation. Suozzi's effort to get cryonically preserved began when she asked the Reddit community for help. At the time, she was only expected to live for another three to six months, making her request for financial assistance all the more urgent. "I want to be cryogenically preserved when I die from brain cancer but can't afford it," she wrote, "I am literally begging for financial help." Needless to say, preservation and storage at a cryonics facility like Alcor Life Extension Foundation or Cryonics Institute is not cheap. A standard Alcor suspension costs $70,000.00, which includes high quality stand-by, neuropreservation, and storage — but only if the terminal member relocates to the Phoenix area (otherwise the additional stand-by and transport costs bring the total to $80,000.00). A whole-body preservation at Alcor costs $200,000.00. Cryonics Institute charges $28,000.00 for a whole-body preservation, but this fee does not include stand-by and transportation costs. Both companies use vitrification preservation chemicals that stops the formation of damaging ice crystals, but they also have different facilities and procedures. Most members of Alcor and CI are able to meet these costs by taking out a second life insurance policy and naming the cryonics company of their choice as the beneficiary. Preservations are only conducted on patients who have already been pronounced clinically dead. Soon after Suozzi's posting on Reddit, she set up her own fundraising campaign. Quickly thereafter, a cryonics-friendly futurist group called Society for Venturism set up its own charitable fund. This group, a volunteer-run not-for-profit, is no stranger to this process; it has already successfully raised funds for two cryopreservations and is currently working on one urgent case. Between the two fundraising efforts, enough money was raised for Suozzi to be cryonically preserved at Alcor — a procedure that was undertaken a few days ago. Alcor will be issuing a statement shortly. 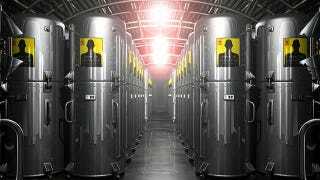 "When funds are raised for a cryonics charity recipient they can choose to contract with the cryonics organization of their choice," Shannon Vyff told io9. "It is up to them to set up their contract; the Society for Venturism will then provide funds to the cryonics organization they have contracted with." Vyff is a board of Society for Venturism, and an Alcor and Cryonics Institute member. "I have been happy to help the cryonics community, and at times it is hard raise funds for a charity recipient," she told us. "Kim's case was compelling to many people — not only did many cryonicists donate but non-cryonicists as well." After having worked on one charity case before and hearing about how two past cases went, Vyff was impressed with how quickly funds were raised for Suozzi. Within just months she had enough to fund a neurosuspension with Alcor. Our hope is that technology will continue to progress to the point that Kim may have a real chance of living again in the future. Unfortunately, the development of the requisite technologies could be decades or centuries away. Since Kim is no longer with us to explore and innovate in the field of neuroscience, she is counting on all of us to push for the innovations she had hoped to see in her lifetime. Prior to her death, Suozzi had been in touch with another Society for Venturism case, Aaron Winborn, a 45-year-old man struggling with ALS. Hoping to help, but frustrated by her failing health, she contacted him and apologized that she could not do more. Those looking to help can do so here. Top image courtesy Christopher Barnatt/ExplainingTheFuture.